I am currently in Orlando, Florida for the incomparable Food & Wine Conference sponsored by Sunday Supper and a host of other sponsors and brands, acting as brand ambassador for Dixie Crystals sugar--promoting the brand and the winners of the Dixie Crystals Brownie Dessert Contest, as I won the contest last year! Knowing I'd be in Orlando during the conference, I still signed up to post, knowing I could just schedule and be on my merry conferencing way. I made my salad, shot some photos on my back porch in Winston-Salem, North Carolina and planned to edit later. Well, the shots ended up being blurry, ugly (UGHHHH!) and supremely unusable. Did I mention blurry? I'll spare your eyes because all evidence has been deleted! I was to leave for Orlando in just a few short hours. What's a girl to do? I packed a fresh English cucumber, fresh dill, some leftover browned butter vinaigrette in a Ziploc bag (3 oz. TSA approved, of course) and a half-pint of fresh blackberries I purchased at Food Lion in my carry-on. I was going to recreate my salad in my room and shoot the salad under the beautiful setting of the Rosen Shingle Creek Resort. The conference has been action-packed and there was plenty of down time, but the pools, the spa, the restaurants and the gorgeous view from my room pulled me away from thinking about my un-photographed dish. I had to order a knife to be delivered to my room (hello, room service) so I could complete my dish. Was it worth the trouble and this ridiculous adventure? Make this salad and YOU be the judge. This week, Melanie of Melanie Makes and Jennie of Messy Baker Blog are kicking off this Summer BBQ party the right way by being gracious, thoughtful co-hosts. Don't forget to check them out and tell them Nik Snacks sent you! Slice English cucumbers into rounds, 1/4 inch thick. If using Kirby or other variety of cucumber, slice the cucumbers in half lengthwise and use a spoon to scoop out the seeds in the middle, then slice into rounds (or crescents, at this point). Put the sliced cucumbers in a colander and sit the colander in a large bowl. Sprinkle with salt and let sit in the refrigerator for an hour. Drain the cucumbers and toss with black pepper and the fresh dill. Meanwhile, melt the butter in a small skillet over medium heat until browned but not burned (it should smell like toasted nuts) about 5 minutes. Remove from heat and set aside. In a blender or food processor, combine the fresh blackberry juice, (or blend 1/4 cup blackberries in juicer or food processor before beginning) vinegar, shallot and mustard. Blend until smooth. With the motor running, slowly drizzle in the reserved brown butter and blend until thickened. Season to taste and set aside at room temperature until ready to toss and drizzle with the sliced cucumbers. Don't forget to visit others sharing Summer BBQ Party recipes through Sunday Supper. You will find something to help you take your next BBQ up a few notches! This salad looks worth all the trouble! Love the flavor combo and beautiful plating! That is dedication to recreate this in your hotel room and bring it on a flight to Florida. Sounds fabulous and hope you are enjoying the conference! What a delicious salad for a Summer BBQ Party!! I am so stealing this blackberry browned butter vinaigrette! So intrigued by this flavor combination! You are a ROCK STAR! You made this dish in your room???? Wow. It sounds wonderful. I am so happy I got the chance to meet you in person! You are magnetic and see why your life has changed in such positive ways! What a great combination of flavors Nikki! Your salad sounds great! Yum. Super delicious and bodacious, just like you. It was great to meet you. You Rock. I love cucumber salad and adding blackberry sounds like a very good idea! That is SOME dedication! Amazing that you managed to do this while away at the conference. I hope you had a blast--I know I'm going to love seeing your recipes from here on out! Lovely to meet ya! WOW! What an interesting and creative recipe! I adore the sound of a browned butter blackberry vinaigrette! My mouth literally watered when I read the title of your recipe! That is seriously creative! I'm impressed! Wow, that's quite a commitment, taking the ingredients with you to reshoot in the hotel room! Sounds great! This is very classic, indeed! And i love anything with blackberries in it! 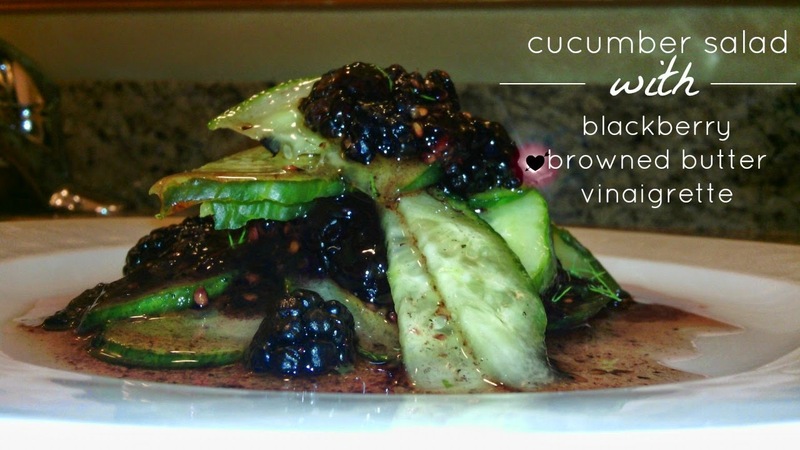 Love that you added blackberries to the classic cucumber salad! Love the addition of blackberries! This salad looks delicious! My favorite dressing is raspberry vinaigrette. Your blackberry vinaigrette is a wonderful idea! I would probably like that even better!! What a fun, creative recipe! It sounds absolutely delicious! I hope I'm able to link up with you and hopefully you'll be able to join in on the conference fun NEXT year! Thanks so much, Liz! And yes, I did! I mixed it up in the ice bucket lol And it was such a joy getting to know you. See you soon! This sounds really intriguing! It's the brown butter that really grabbed my attention, I don't think I've seen it on salad before. Girl, you are a rock star! I am so impressed you managed to pack all this and take pictures of it during the conference. It looks wonderful! I was so super bummed I didn't get to join in guys in Orlando- next time for sure! I never would have thought up this combination. It sounds wonderful and thanks for the recipe. Blackberry brown butter sounds crazy good! Wow that blackberry and brown butter sounds strange and yet amazing. When the blackberries are ripe here I think I need to give this a try. 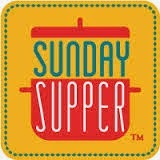 I will definitely check out your Sunday Supper parties! 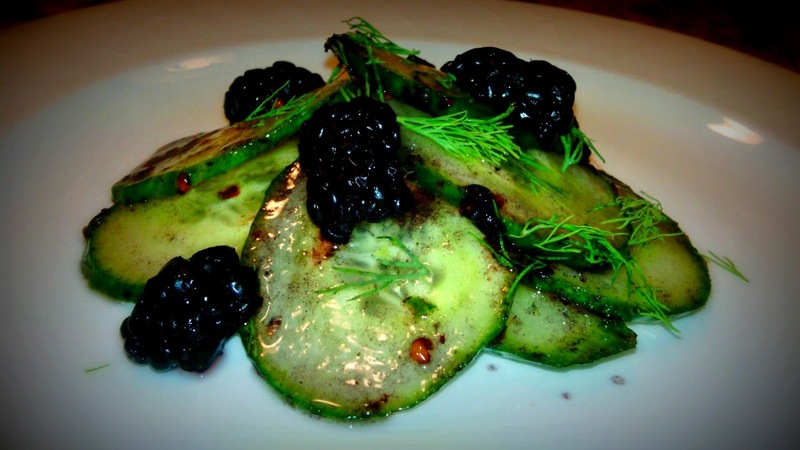 How creative to add blackberries to your cucumber salad. Love it! I love the unique combination of flavors in this salad! I love unique salads, and this certainly fits the bill! Yum! So glad your salad came together!! It sounds delicious! I just picked up some gorgeous blackberries today too, so I just might have to make this for lunch. Yummm! You are such a treat! It was so nice to meet you in FL this past weekend. Ah, the life of a food blogger! A story only a fellow food blogger can understand. You get bonus points for bringing it all with you to the conference and photographing it there!!! I love this dish, and will be making it pronto. It was so nice to meet you at the conference!! I can't believe you threw this together in your hotel room! Sounds like a delicious salad to me--browned butter? w00t!